Today we are launching the Google Maps SDK for iOS 1.11, which includes bitcode support, new events and some features previously available only in the Android SDK. Bitcode is an intermediate representation of your app that is uploaded to the Apple Store. With this abstraction, Apple can optimize for specific target devices at provisioning time. The Google Maps SDK for iOS 1.11 also introduces two new events: didLongPressInfoWindowOfMarker and didCloseInfoWindowOfMarker. The long press event takes advantage of iOS long-touch as another way for users to interact with Maps SDK for iOS enabled apps. The close event is particularly useful if you wish to programmatically zoom back out on the map after the user has looked at the detail associated with a particular marker. We have also added start and finish rendering events to the GMSMapViewDelegate and GMSPanoramaViewDelegate protocols. The start rendering events are triggered when tiles have just been requested or labels have just started rendering. The finish events are triggered on rendering completion for tiles and StreetView panoramas, respectively. Take a look at our release notes and update to Google Maps SDK for iOS 1.11 today. This entry was posted in Geo Developers Blog and tagged developers, Geo on November 30, 2015 by Maps Devel. Containers are all the rage right now. There are scores of best practices papers and tutorials out there, and "Intro to Containers" sessions at just about every conference even tangentially related to cloud computing. You may have read through the Docker docs, launched an NGINX Docker container, and read through Miles Ward’s Introduction to containers and Kubernetes piece. Still, containers can be a hard concept to internalize, especially if you have an existing application that you’re considering containerizing. In the first part of the series, you’ll learn how to create a container image that includes everything a Minecraft server needs, use that image on Google Compute Engine to run the server, and make it accessible from your Minecraft client. 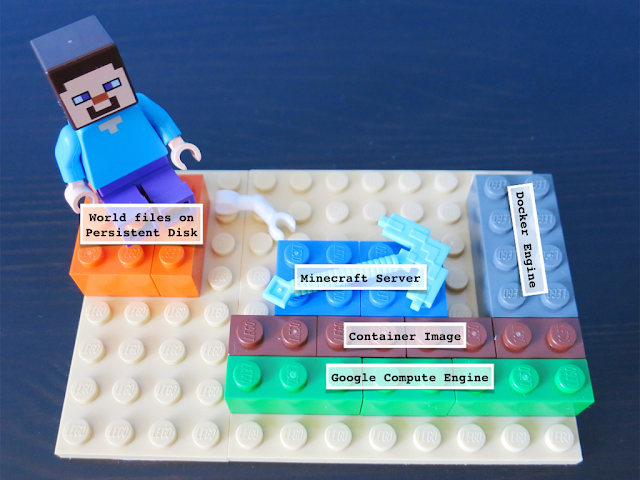 You’ll use the Docker command-line tools to build, test, and run the container, as well as to push the image up into the Google Container Registry for use with a container-optimized instance. Next, you'll work through the steps needed to separate out storage from the container and learn how to make regular backups of your game. If you’ve ever made a mistake in Minecraft, you know how critical being able to restore world state can be! As Minecraft is always more fun when it’s customized, you'll also learn how to update the container image with modifications you make to the server.properties file. Finally, you’ll take the skills that you’ve learned and apply them to making something fun and slightly absurd: Minecraft Roulette. This application allows you to randomly connect to one of several different Minecraft worlds using a single IP as your entry point. As you work through this tutorial, you’ll learn the basics of Kubernetes, an open source container orchestrator. By the end of the series, you’ll have grasped the basics of containers and Kubernetes, and will be set to go out and containerize your own application. Plus, you’ll have had the excuse to play a little Minecraft. Enjoy! This blog post is not approved by or associated with Mojang or Minecraft. This entry was posted in Google Cloud Platform Blog and tagged cloud storage, Compute Engine, Google Cloud Platform on November 30, 2015 by GCP Team. The perfect image of your next big adventure, knitting project or style-changing haircut is bound to exist somewhere out there. But what happens once you find the image? Take a screenshot? Maybe try to save the webpage? Starting today there is an easier option: you can now star and bookmark images directly from Google’s image search in your mobile browser. Let’s say you’re searching for “bob hairstyles” on Google and an image catches your eye. Simply select it and tap the star. Next time you’re at the stylist, you can easily access the picture without having to dig around or do another search. Once you’ve starred a few images, you can keep them organized in folders: to add an image to a folder of similar items, tap the pencil shaped edit icon. Create a grouping such as “haircuts for the winter” or “snowman ideas” and your image will be added to a folder with similar ones. This feature is currently available in the US when you search for images on mobile, across all major browsers on both Android and iOS. To try it out, make sure you’re logged into your browser with your Google Account; then you can start image searching and planning that next adventure. This entry was posted in Inside Search Blog and tagged Google Search, Seach, Search Engine on November 30, 2015 by Inside Search. 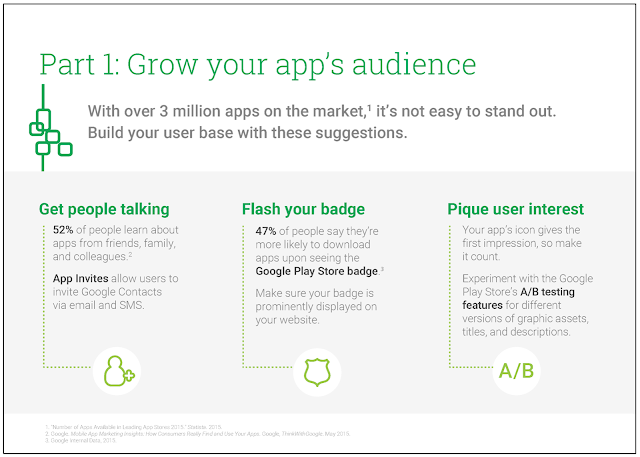 This entry was posted in DoubleClick Publishers Blog and tagged Ads, DoubleClick, mobile, Publishers on November 30, 2015 by Stephen Kliff. The fourth annual Digital Analytics Association (DAA) San Francisco Symposium is coming up! Join us on Tuesday, December 8th as we host the symposium at Google’s San Francisco office. This year’s event is focused on how all businesses use data to optimize, personalize, and succeed through the holidays. When: Tuesday, December 8th, 2015. Registration starts at 12:30. Program runs from 1:00 to 5:30, followed by a networking reception. San Francisco locals, this Symposium is organized by local DAA members and volunteers. We encourage you to become a member of the DAA and join our local efforts. Become a member and reach out to one of the local chapter leaders, Krista, Charles or Feras. This entry was posted in Google Analytics Blog and tagged Analytics, Google Analytics, Training and Events on November 30, 2015 by Adam Singer. Les Kenny was around 50 years old when he first used a computer. BuildEazy was his first website, designed to show people how to make everyday things out of wood. Every BuildEazy project, whether it’s a guinea pig hutch or a picnic table, comes with detailed plans, material lists, tool lists and step-by-step instructions, so anyone can give it a try. What began as a hobby soon became a source of income as Les began dabbling with AdSense on the site. By experimenting with the position of ads, he went from earning a few dollars a day to a steady income. Eventually Les was able to give up his day job as a building contractor and host BuildEazy full time, giving him the freedom to do what he loves (and hang out with the grandkids). He’s still authoring projects and BuildEazy is going from strength to strength. Almost two million people are using AdSense right now. Learn more about how to start turning your passion into profit today. This entry was posted in Inside AdSense and tagged AdSense on November 30, 2015 by John A.Smith. Drones are now toys: Drones are no longer expensive playthings for the tech-savvy. Search for “toy drone” and you’ll find countless inexpensive, easy-to-use devices available from department stores and toy stores. And they’re popular—nationwide, shopping searches for drones are up 80% over the past year, and they’re highest in California. Hoverboards are real, and they’re trending: While we’re on the topic of electronic toys, hoverboards are so popular this year they’ve even overtaken searches for drones. They may not be exactly like the boards from Back to the Future or the Lexus commercial, but these two-wheeled boards have become a hot toy this season. 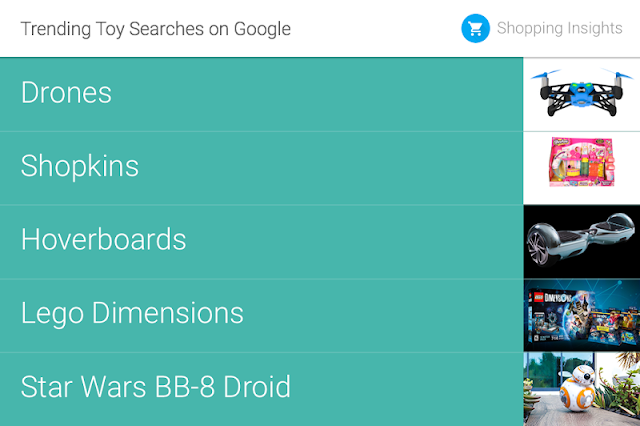 Searches for “hoverboards” started trending in the summer and are up more than 500% since July. Your 90s wardrobe is BACK: Bomber jackets. Levi jeans. Adidas Superstars. Looking at this year’s top-trending apparel list you’ll be forgiven for thinking we’ve gone back to the 90s. Not only have we seen searches for these 90s fashion trends more than double over the past year, each city has their own 90s fashion item of choice—shoppers in Chicago are more interested in Levis while shoppers in New York are on the hunt for Adidas Superstar shoes. “Smart” devices top electronics searches: With more models on the market than ever, both smart watches and smart TVs topped our list of trending electronics this year—with “smart watch” searches seeing a particularly phenomenal growth, up nearly 300% compared to last year. But as smart devices get more popular, retro electronics are also making a comeback: searches for instant cameras like “Polaroid Camera” and “Fujifilm Instax” have been rising steadily in popularity each holiday season. So there you have it. Ready to start shopping? 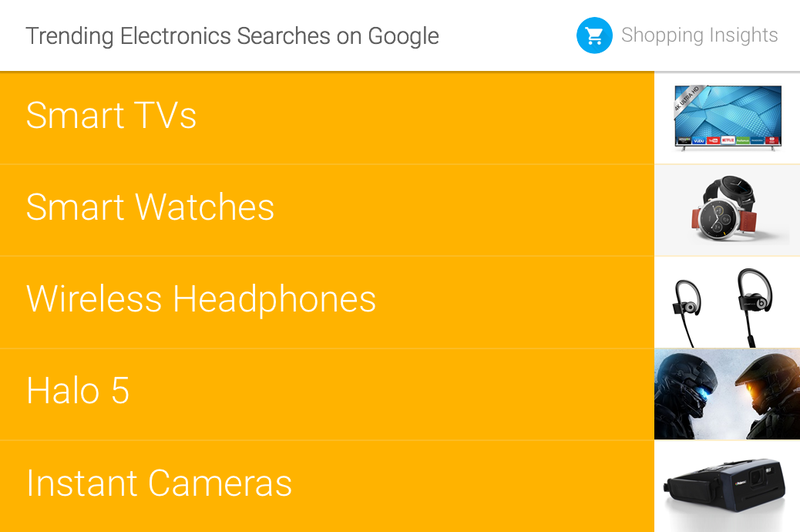 To help you search for these gifts quickly and easily while on-the-go, we recently redesigned Google Shopping on mobile. 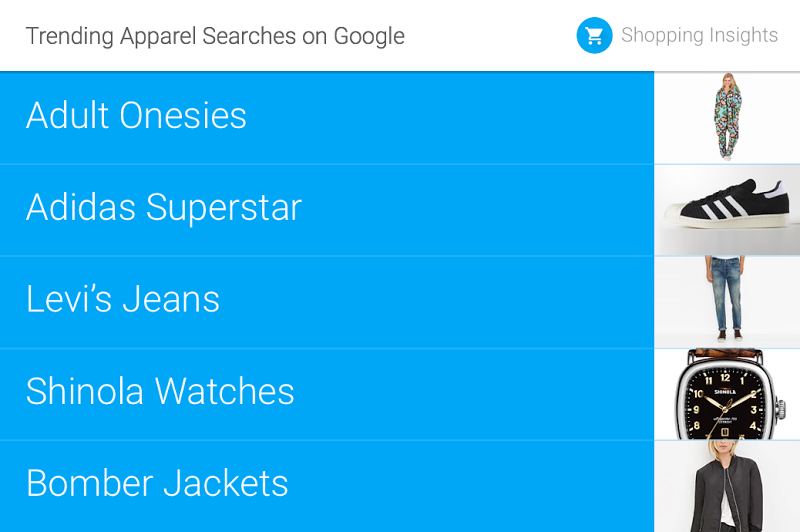 And for more insights behind this season’s trends, check out the Shopping Insights tool. Happy deal-hunting! This entry was posted in Official Google Blog and tagged shopping on November 30, 2015 by Google Blogs. Google Apps for Education isn’t just a way to share information – it’s the learning hub at Arlington Independent School District (case study) in North Texas. Students and teachers at Arlington ISD create more than 50,000 documents in Google Docs during any given week, and students can access this bounty of information when they aren’t in the classroom. For example, physical education students used heart monitors to measure their heart rates during different activities. 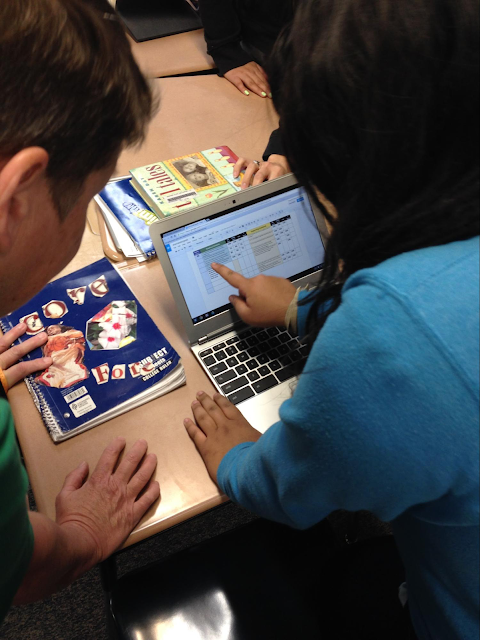 As a homework assignment, they analyzed the data in Google Sheets and shared their findings with their peers. With the affordability of Chromebooks, more students have access to devices. When students leave the classroom, they can sign onto Chromebooks on loan through the 1:1 program and access Google Apps for Education to continue learning, regardless of their technology options at home. This entry was posted in Google for Education Blog and tagged Education on November 30, 2015 by Googlefor Edu. This entry was posted in Google for Work Blog and tagged Chromebooks for Education, Google Apps for Education, Google for Education on November 30, 2015 by Jane Smith. From polar bears in the Canadian Arctic, to communities in the Brazilian Amazon, to blue oak trees in Central California, the impacts of climate change is being felt by plants, animals and people across the planet. As world leaders gather for the COP21 conference in Paris this week to discuss our changing climate, we want to take this opportunity to show you how to explore its impact yourself. With Street View, you can get a window into some of our world’s changing ecosystems, and learn how nonprofit and other organizations are working to keep our planet healthy. Polar bears are in trouble because of the melting sea ice, on which they depend to survive. That’s why Polar Bears International (PBI) borrowed the Street View Trekker to map polar bears in their fragile sea ice habitat around Churchill, Manitoba, to share the remote ecosystem with people all over the world. And to educate classrooms, PBI created a lesson plan and activity for schools to do their own exploration of this precious habitat. Ever wonder how plants are faring in a changing climate? Scientists at the Nature Conservancy-California do, too. To help them learn more, they borrowed the Trekker earlier this year to monitor the health of blue oak trees in Central California, which have declined due to stress from changing temperatures. Scientists predict that blue oaks may lose up to 41% of their population by 2100 because of climate change, so they plan to capture Street View imagery again in the future so they can keep a digital record, log their changes, and design conservation strategies to protect the life of these blue oak trees. Experts agree that one way to slow climate change is to protect the standing forests that we have now, as these trees remove and stock carbon dioxide from our atmosphere. The Brazilian nonprofit Amazonas Sustainable Foundation (FAS) borrowed the Trekker to show people exactly what the Amazon forest looks like on the ground and put isolated local communities on the map. They captured imagery from three different reserves in the Brazilian Amazon, including hundreds of kilometers walking through pristine forests and floating down Amazon river tributaries. The nonprofit is using the imagery to educate the world about rainforest protection and sustainable ecosystem management. Street View is great for visualizing the impacts of climate change, but we’re also using our Street View platform to measure climate data, which can be used by scientists, policymakers, businesses and citizens to drive better decisions. For the past few years, Google Earth Outreach has worked with the Environmental Defense Fund (EDF) to map thousands of methane leaks from natural gas lines under select U.S. city streets using Street View cars equipped with methane analyzers. Recently, one of the largest U.S. utilities, PSE&G announced that they will use data and maps from our Street View mapping effort to prioritize the replacement of hundreds of miles of gas mains and thousands of service lines for their newly approved multi-million dollar pipeline replacement program. Google Earth Outreach has also partnered with Aclima to measure many more pollutants with Street View cars, including particulate matter, black carbon, and carbon dioxide—pollutants that are harmful to both our climate and our health. Essentially, we’re turning Street View cars into environmental sensing platforms, and plan to map California communities in the San Francisco Bay Area, Central Valley, and LA regions through 2016. We hope this post has opened your eyes to the ways the world is being impacted by climate change. If you’re interested in getting involved, consider submitting an application to the Trekker Loan Program, which allows nonprofit and other organizations to borrow the Trekker to capture 360-degree imagery of the places they care about on our changing planet. This entry was posted in Google LatLong Blog and tagged LatLong on November 30, 2015 by Lat Long.